Fall brings the first real rains since early summer and with it a multitude of pacific salmon. There are the major players, chinook, and coho. They are the main draw for most all of the sport fishing crowd regardless of method. While coho and chinook are quite fun, there’s another quite literal underdog; the chum salmon. Chum salmon are some of the finest sport fish available and often go unnoticed in the shadow of the more popular chinook and coho. I think there are a variety of reasons for this. The first and foremost reason I think is that they are not the greatest fish for the dinner table. Historically they have never held much importance as a food fish so the transition from harvest to sport that we have seen in recent years has left them more or less out of the equation entirely. Secondly some people find their appearance less than aesthetically pleasing. They have large canine teeth and are often showing their purplish bars relatively quickly once entering freshwater. 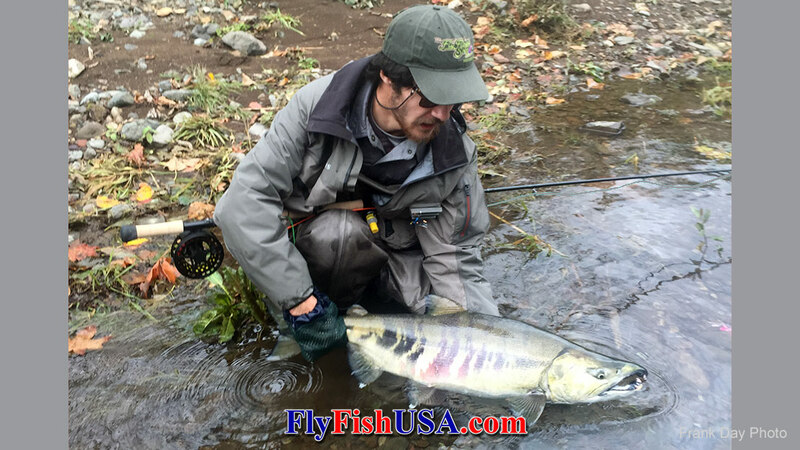 Regardless of these preconceived notions chum salmon are a phenomenal fish to chase with any sort of fly tackle. On particularly rainy days the opportunity for chrome bright fish that are nearly indistinguishable from sockeye can be had. Despite chinook being the regular show pony in the drag testing arena chum salmon are a close second. Chum salmon pound for pound pull just as hard, if not harder than chinook. Chinook usually have the upper hand simply because there’s just bigger on the average. A large male chum salmon fresh off the tide will often make you wonder who has who and if your drag will tighten down any further. They make long powerful runs and will occasionally display aerial acrobatics that rival that of a steelhead. Oregon’s chum salmon are typically larger than the average Alaskan chum salmon. The males run larger than the females. A typical male will be anywhere from 10-15lbs with fish up to 25lbs available. The typical female chum is a more modest 8-12lbs. These fish require stout tackle. 8-10wt spey rods and 9-11wt single hand rods are appropriate. A clicker reel can get the job done for the adventurous, but a smooth reliable drag reel usually gets more fish to the bank. 15 and 20lb tippet in a 4’ length is a standard leader for taming these fish. Chum salmon are also very grabby fish. 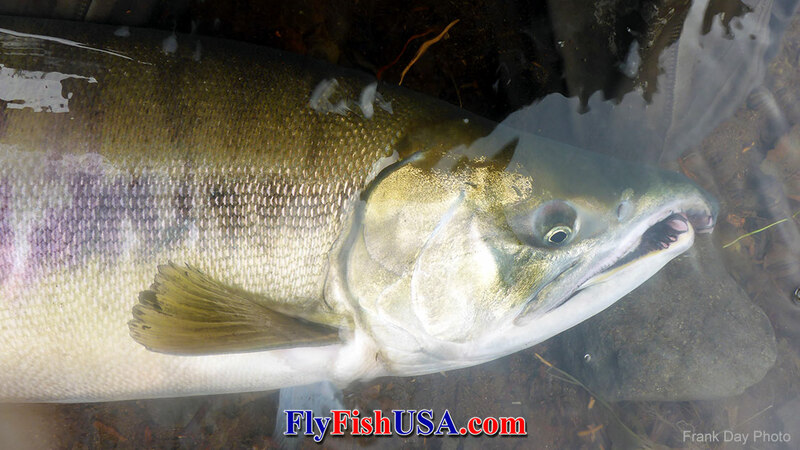 They are extremely aggressive towards swung flies in a wide variety of shapes sizes and colors. When they are fresh from the ocean and rested they will even take a popper off the surface. Because they are so grabby they are an excellent fish for beginning spey anglers. 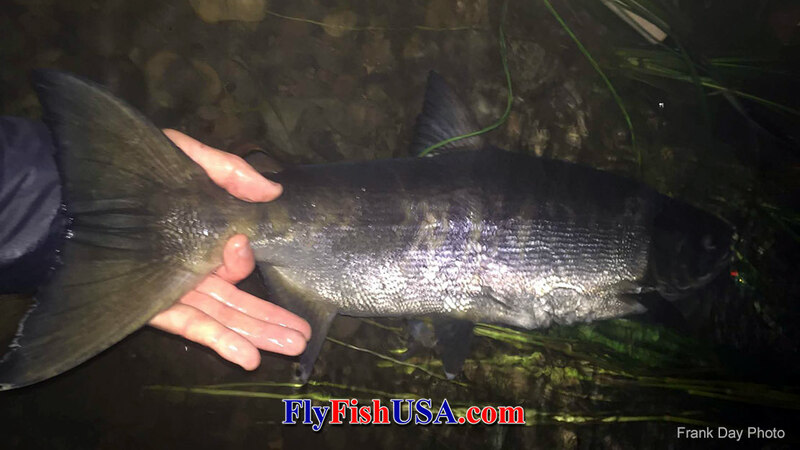 Winter steelhead and chinook salmon are more difficult to catch and require more skill in fly presentation to be successful. This isn’t the case with chum. If they’re around and you are fishing your fly correctly they will let you know in the form of a solid tank on the end of your line. They also are highly school oriented so once you get one in a spot it’s highly likely that you’ll find a few more. They’re also a great practice fish. Because catch rates are higher it’s a great way to practice hooking, playing, and landing a large anadromous fish. The more chum salmon you land this fall the more likely that the first winter steelhead you meet will be business as usual and make it to hand. If you are interested in pursuing these fantastic fish this fall with us give us a call at toll free at 1-800-266-3971 or email mark@flyfishusa.com or frank@flyfishusa.com for booking information and availability. Let us share one of the most overlooked fisheries Oregon has to offer.